Do you feel restless? What if this feeling weren’t a bad thing? This feeling could be a longing, a restlessness for more of God. It could push us to move forward, to live epic lives that were designed before the foundations of earth were laid. But a lot of us, if we’re honest, are afraid. We hold close to our chest new and scary dreams that may just be from God to play a small part in something bigger. God wants to take the seemingly mundane messy threads of your life to weave something beautiful. What would happen if God got bigger than your fear and insecurity, and you spent the rest of your life running after his purposes for you? 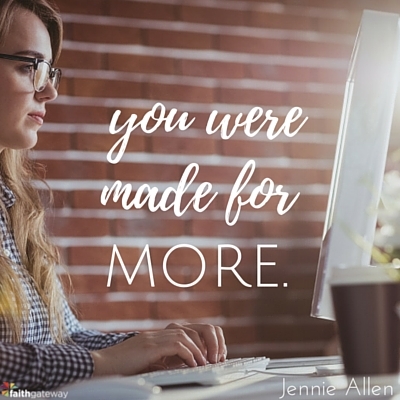 Jennie is an award-winning and bestselling author and Bible study teacher who will walk you through a practical plan to identify the threads of your life and how to intentionally weave them together for God’s glory and purposes. The place where you restless soul meets God is the place where nothing ever feels small again. 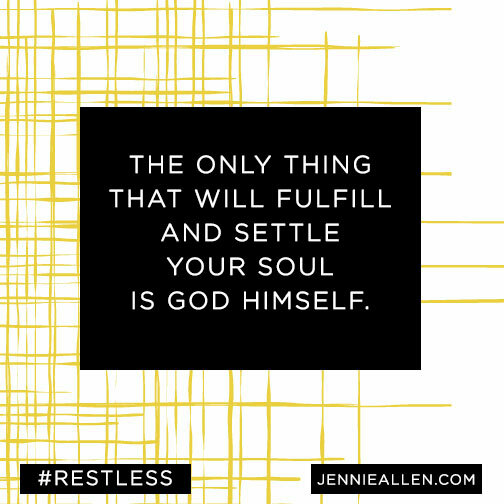 Restless is about God. It’s a book about us and God. And it is a book about the moment we close our eyes and see God. Restless is a book about facing the God of the universe and answering to Him about the life and the resources that he gave us while we were here. And because I think we all want that moment to go well, Restless is about discovering ourselves and getting over ourselves all at the same time, being brave enough to imagine a better world and how we may be used to make it that way. I believe this is from Him and I pray it will spark something in you… a vision perhaps of the unique reason God keeps issuing you breath. No, this is what was spoken by the prophet Joel: In the last days, God says, ‘I will pour out my Spirit on all people. We live in the last days. 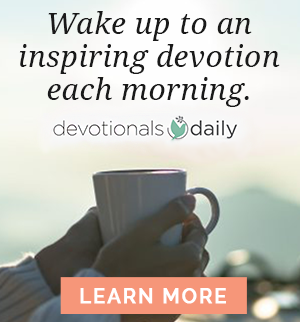 We are filled with the Spirit of God, and we’re living on this earth for relatively few days to accomplish the will and work and wonders of God. Why do we do this? So that “everyone who calls on the name of the Lord will be saved” (Joel 2:32). The Spirit of God has dreams for you. What if the things that have caused the most hurt in your life became the birthplaces of your deepest passions? May this be the place where your restless soul meets God and where dirty beige sofas become beautiful and where no life or minute or breath ever feels small again. I can’t deny that the answers to many of my son’s questions are painful. Abandonment usually undergirds the beautiful tragedy of adoption. Even though he finds himself in a loving family now, we can never make that painful truth go away. “Not one part of you is by accident, Cooper. God made you and placed you in your African mama’s tummy. He knew even then that I would be your forever mama and we would be your forever family. We were made for you and you were made for us. “Cooper, you were made to show the world God. Everything that God gives you, your Africa, your America, your dark skin and your strong legs, your hurts, your words, your blessings, your smart mind… everything you have is to use for God while you are here. My five-year-old needs to know his life was on purpose and for a purpose. He wants to know he wasn’t an accident. I can’t take away the pain of his story, but I can tell him there is purpose. We all want to know we are not accidents. We all want to know our stories are going somewhere on purpose. Something deep down inside us is made to live for a story bigger than ourselves—the story of the one who made us. Any other version of this story will consistently feel shallow and empty. Cooper will never make sense of his life until he understands that eternal story, and the God who made him and placed him in his spot. It’s a big earth, and when Cooper studies it, he sees countries separated by a huge ocean and he feels lost and small in it. I think a lot of us feel lost and small. And because of that we desperately want to find “God’s will for me.” We want to know that we exist on purpose and for a purpose. We often try to fi nd “God’s will for me” without simply first understanding God’s will. But we will only ever discover his will for us within God’s will for this earth, for eternity, and for his people. We were made for this story—his story. And yes, he wrote little parts for each of us in his story. Or else we wouldn’t exist. Answer the following questions in your personal journal or the Restless Study Guide. In your own words summarize the story of God’s work on earth as told in Hebrews 10:36-12:3. What was the most defining thing about these men and women? In what different ways did the people in those verses live out their faith? What do you think was the main thing God was accomplishing on earth through these generations of people? 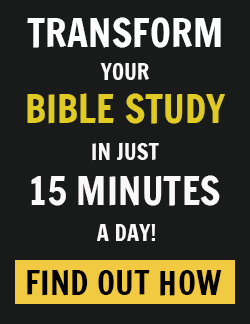 My little Cooper, Rahab, Lance Armstrong, Abraham Lincoln, Alexander the Great, and every other single human on the face of the earth has found his or her story in the confines of God’s story. The history of the world fits in a small crevice of the history of God. And throughout that history, God is after one great purpose. And every one of our unique callings will fit into this one. God is most after his glory. Glory is the visible expression of God’s character on this earth. So just as Abraham in faith followed God into the wilderness, bringing God glory, when you bravely obey or sacrifice or risk in faith to follow God, you bring him glory. We ache to be a part of something great, and it makes us nervous at the same time. We were built for this, but we all fight hundreds of mixed motives and fears. Jesus said of us, “Whoever believes in me . . . they will do even greater things than these” (John 14:12). It almost sounds blasphemous to do even greater things than Jesus. We rarely say it, but often when we start to have great thoughts or visions, we quickly dismiss them, afraid that we may become arrogant or prideful. Or much worse, simply that we would appear prideful. God gave man two commands: be fruitful and fill the earth. He kept repeating this phrase in history in a beautiful effort to fill the earth with his image through us—an earth full of the glory of God. We all will have to fight this. Perhaps it is the biggest hurdle we must cross to living our purposes. At the base of our souls, are we building for God or us? Take just a minute and pray. Ask God to reveal your motives. What is the driving force of your life? Whatever you just wrote, within this great story, God provided the remedy to our souls. To overcome us, God would make a great sacrifice. Christ in us would be the hope of glory (Colossians 1:27). For the joy set before him, he endured the cross. It is a joy that we share. The joy of a forever with a God who is entirely good and who chose us to become his children. The whole earth will be full of his glory; evil will be crushed. Until then we run, showing God to the world and not growing weary. This history of faith we read about in Hebrews is there because God wants us to see we have a part in his story. He wants us to live motivated by faith in the unseen, and to run. So we fight the desire to build our own towers. When we do the great things he prepared in advance for us to do (Ephesians 2:10), but we do them in and through and for the name and glory of God. We were made to do great things, but we cannot live with motives unchecked. If our motives are the glory of God, we have tremendous freedom to dream with hearts that are completely his. I want to have a faith that God can move through. I want Cooper to understand he isn’t just made for a purpose; he was placed in this time and space for the greatest imaginable purpose. He will show God to a world that doesn’t know him, in his beautiful and unique way. He will bring light to darkness. He will assemble the pieces of his life not into a tower for his name that would only crumble, but he will assemble them for the name and glory of the one God Almighty. Well, he’s five, and currently we are working on not throwing rocks, but that’s the hope. That’s the prayer. That’s the sermon he’s going to keep hearing. Our hearts must be completely his before we can start to dream. Jesus said, “I have brought you glory on earth by finishing the work you gave me to do.” (John 17:4). Jesus said this before he died. I want to say that before I die too. Will you join me on this journey?